I’m going to have to start doing these in a little less detail — so much crazy stuff happens in this game I’d be here all night! When we last left our heroes, my daughter Habesha had cancer. 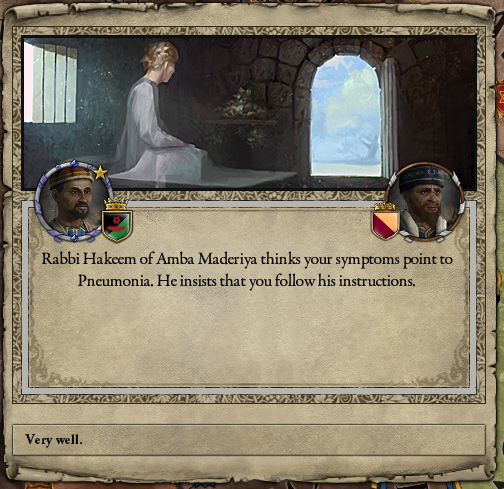 It turns out she’s also possessed! And an awesome spymaster! (And shrewd and deceitful.) I kind of want to know more about this character. 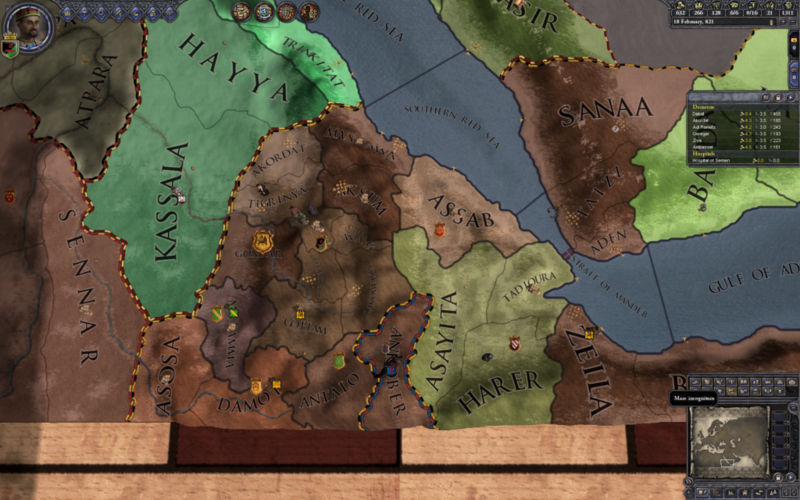 I’m still part of the Kingdom of Abyssinia, though by dint of falsifying claims on other nobles in the kingdom and then taking their land, I’m rapidly becoming the biggest landholder after the king. That’s me in light brown, the king in dark brown, and Duke Wededem in green. I can’t declare war on the king without fighting all the other nobles at once, so I concentrate on trying to get land of Wededem. 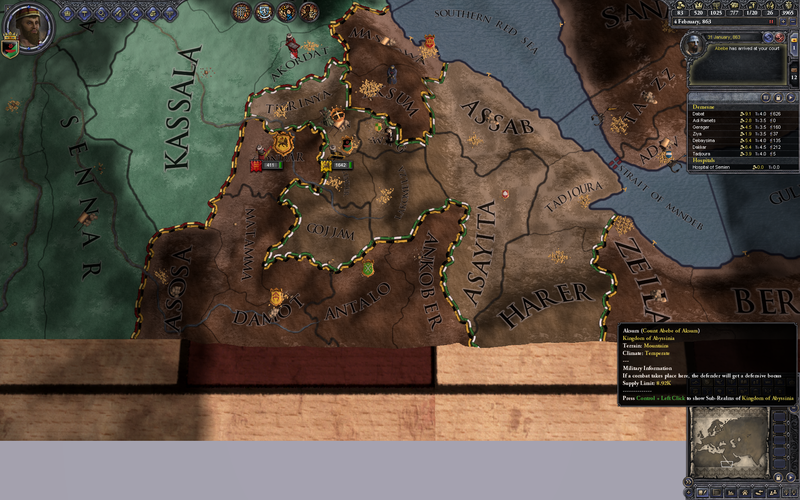 In the meantime, the king takes Berbera, extending Abyssinian rule all the way to the Horn of Africa. My doctors continue their reign of terror. 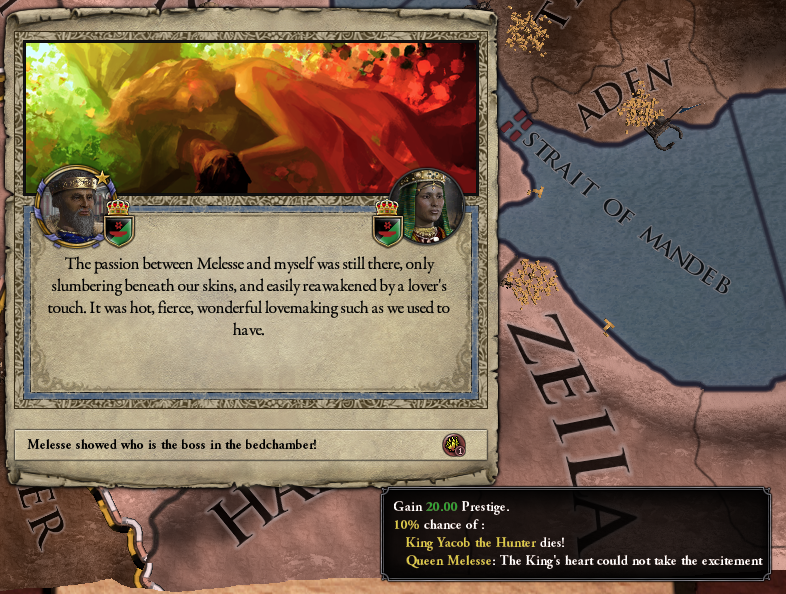 The king’s demands for my lands have put me on notice. It’s time for Semien to be free once again! 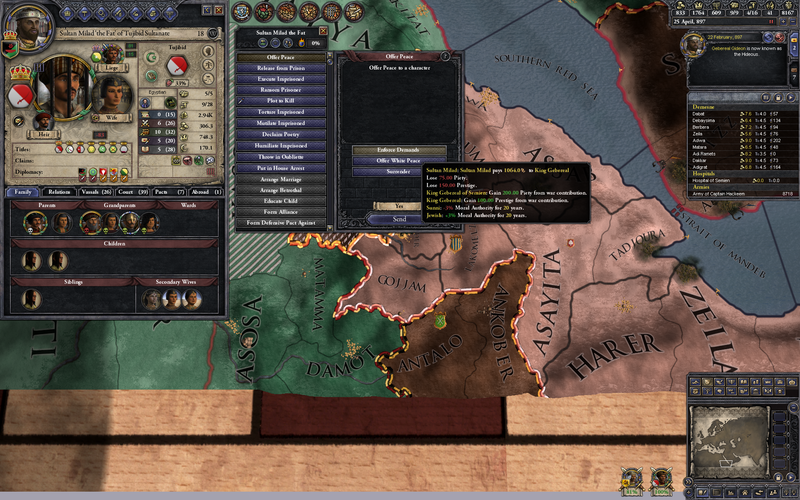 I launch a war of independence and win, with heavy mercenary support. 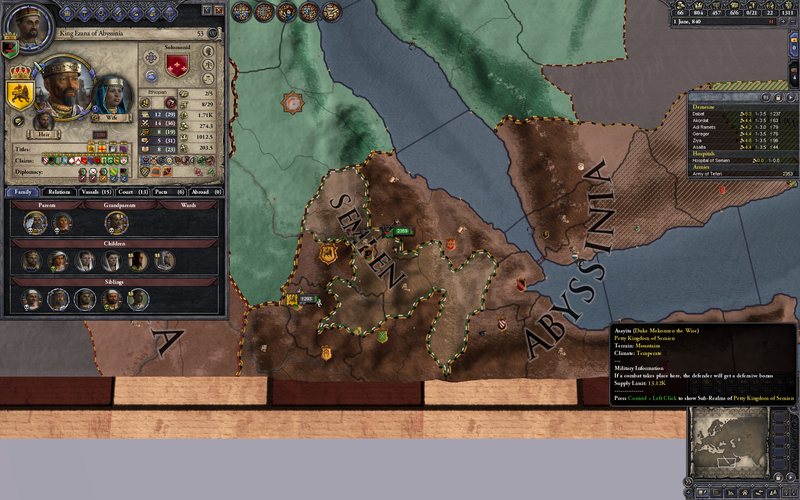 Unfortunately I’m now surrounded by hostile Abyssinia. This is going to take some work. I am beginning to doubt the wisdom of these rabbis. The newly crowned King Mekonnen died soon afterward, presumably of sheer exhaustion. Long live King Bekele! Right then. 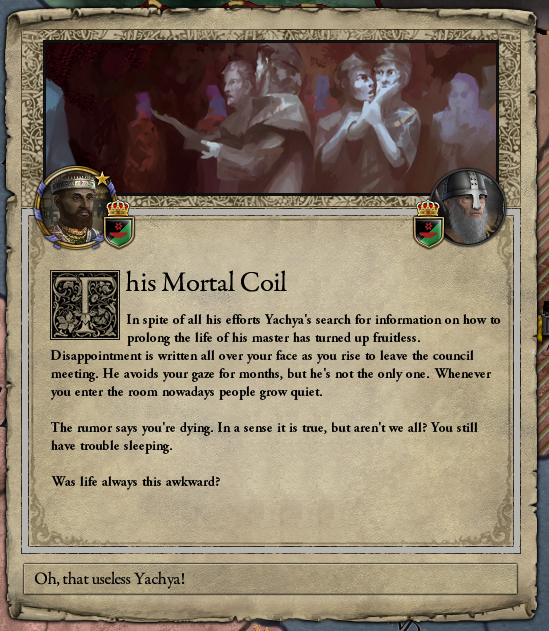 Long live King Yacob! 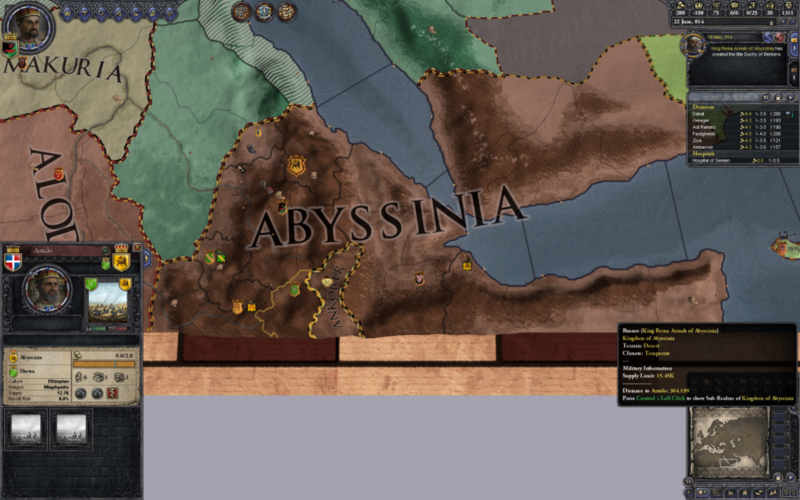 Because the Abyssinians are Miaphysite Christians, I can declare Holy Wars against them and don’t need, like, a reason. This has the downside of having other nearby co-religionists come to their defense, but we’re surrounded by Muslims anyway. 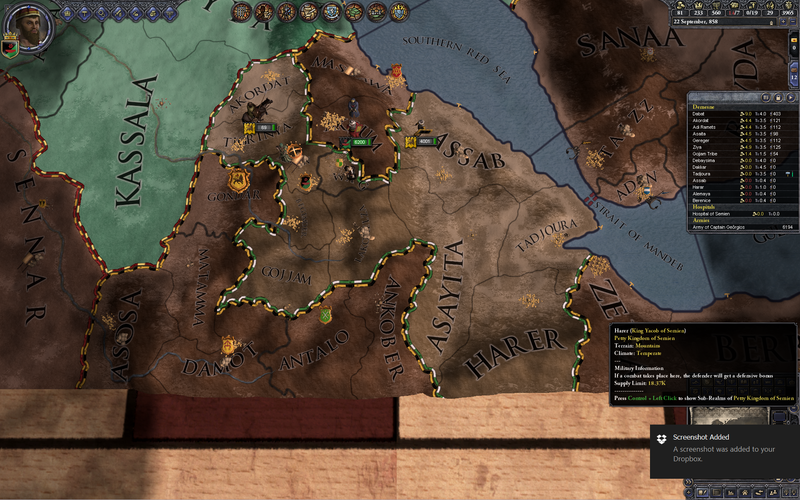 So after some long and extremely expensive warring I manage to grab the Duchy of Afar, which takes the wind out of Abyssinia’s sails. 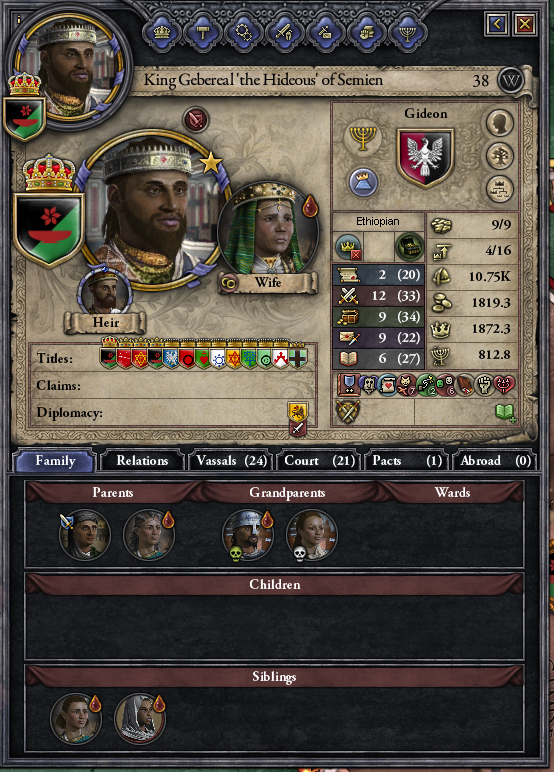 My favorite part of this war: early on, I captured the Abyssinian king’s entire family, including seven or eight children. 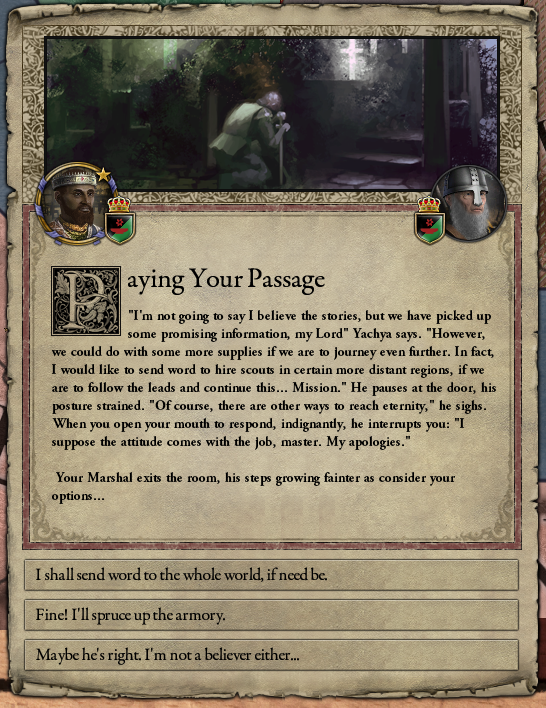 As the war dragged out and my treasury ran low, I ransomed the kids back to him, one by one, to get enough money to keep paying my mercenaries. What a great dad! A long, tense, and hard-to-follow sequence of wars commences. If this were a history book, this is the part where you’d start to lose the thread. I fend off a war of revenge from Abyssinia, but one of the Sultanates that makes up part of the massive Abassid Empire comes and starts nibbling at my northern border. To forestall this, I assassinate the sultan, and then his son, leaving a five year old in charge. He swears eternal revenge which definitely won’t be an issue later. King Yacob: a deep thinker. 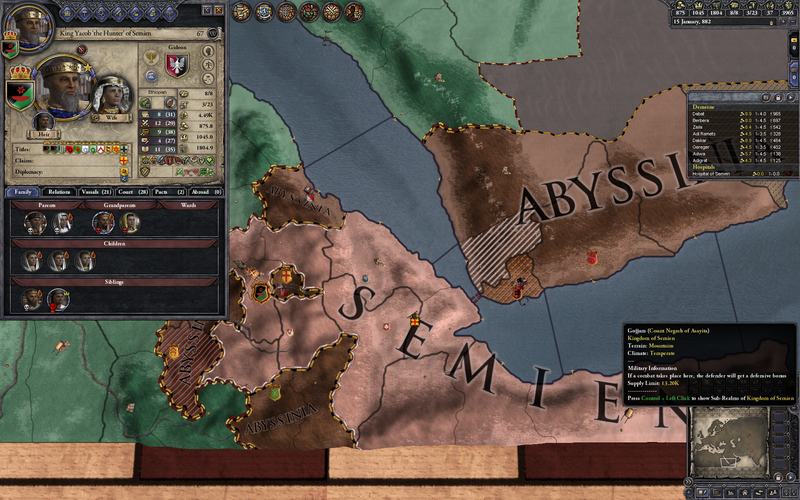 As the Semien/Abyssinian Wars continue, interrupted by brief truces which usually end in assassinations, I get the upper hand, and also promote Semien into an official kingdom! 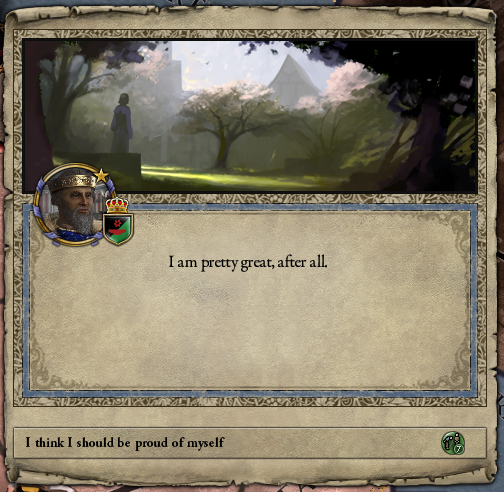 It is, finally, good to be the king. Glancing at the Abbasids at one point, I discover they are at war with somebody named “Maharaja Dundaka III the Mutilator of Varman”, which may be the best name ever. Yacob and his wife continue their passion, even though he’s now in his 70s. 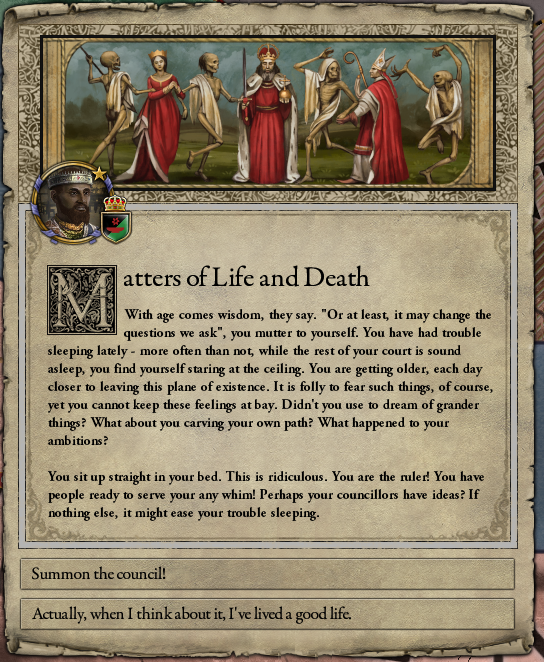 Note the tooltip — 10% chance of death. Also, why does it give you prestige? Is the whole castle watching? 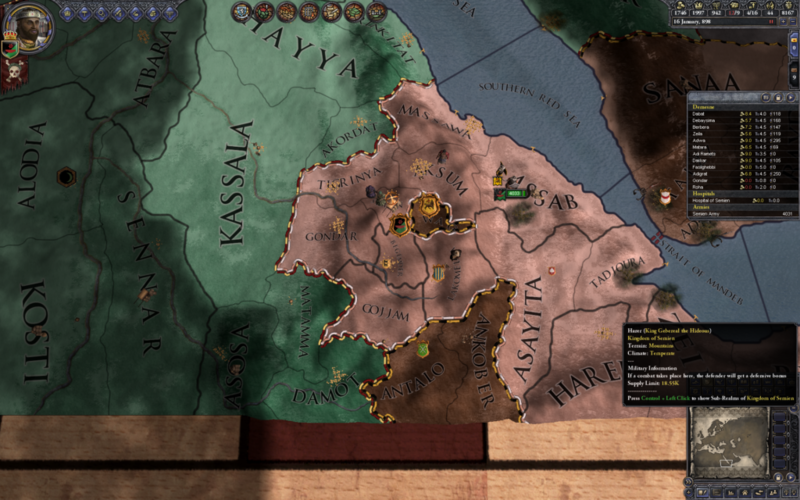 Somewhere in here, the boy-sultan grew up and launched a war of revenge specifically against Yacob, not even for territory. 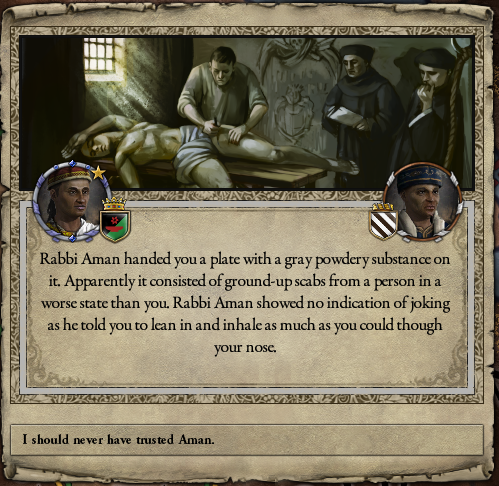 He ended up spending some time in the dungeon until I could raise the money for a ransom. Yacob lived to a ripe old age and much success. Perhaps I’ve broken my streak! Long live King Kafa! 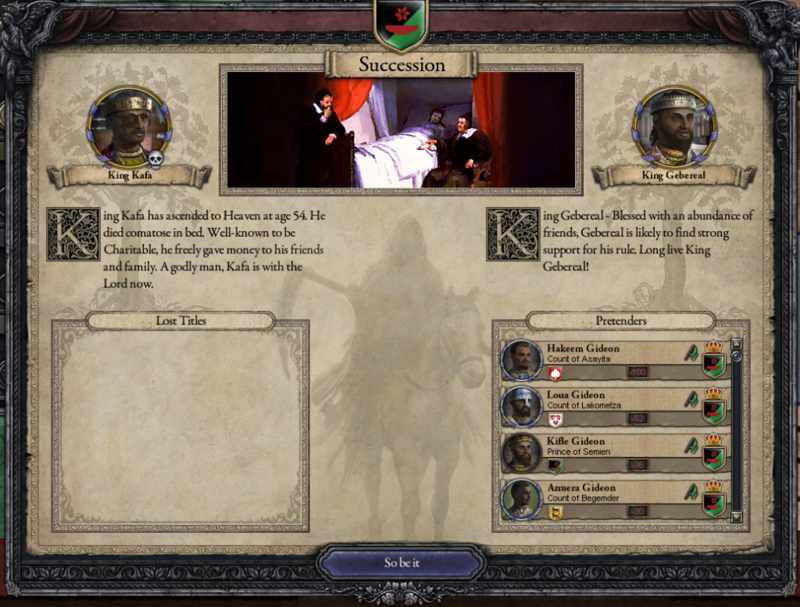 Turns out Kafa was already comatose in bed when he took the throne. Long live King Gebereal! 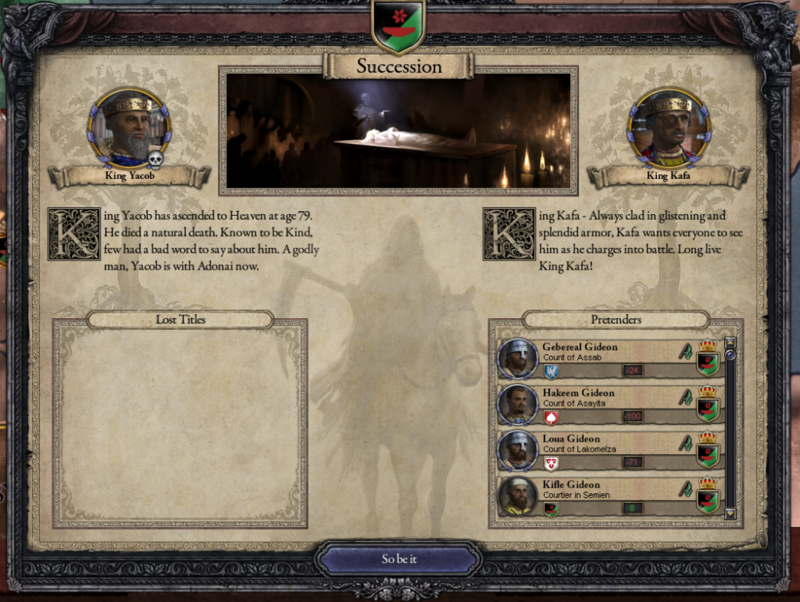 The Tujibid Sultan, all grown up, comes at me again, but this time I fend him off and end up with a sultan’s ransom. 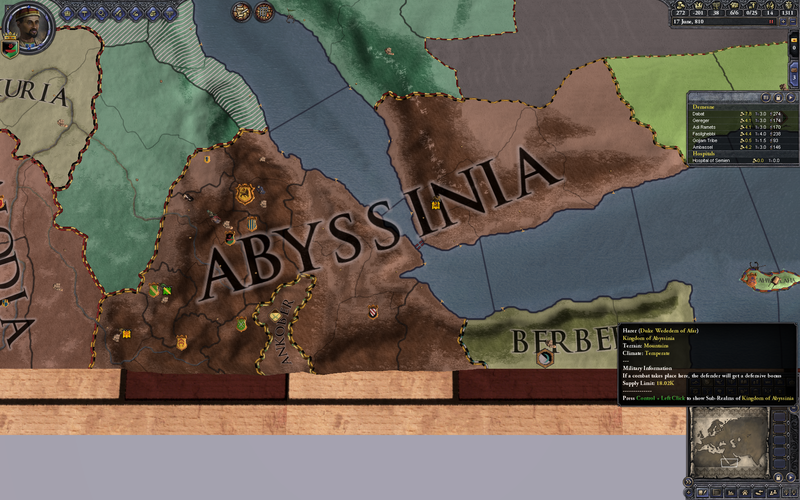 I continue to pick away at Abyssinia, though they still hold Gondar. For a guy called “the Hideous” he looks okay to me. 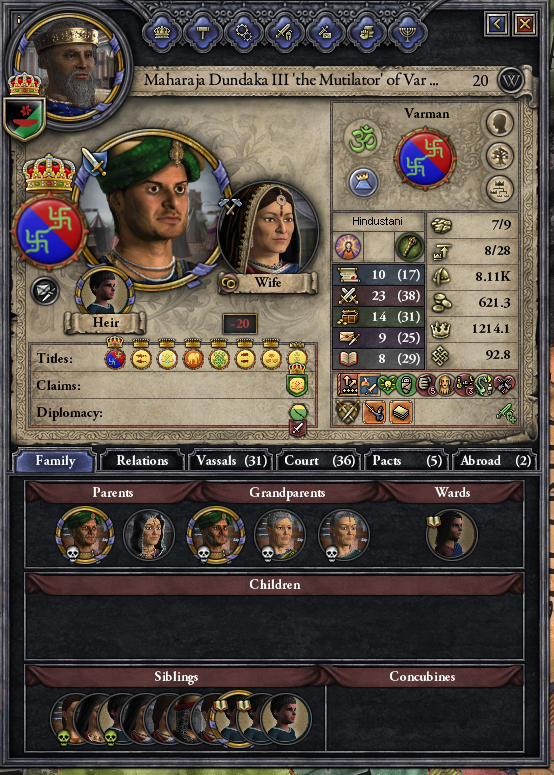 Although he is also possessed, which apparently runs in the family. 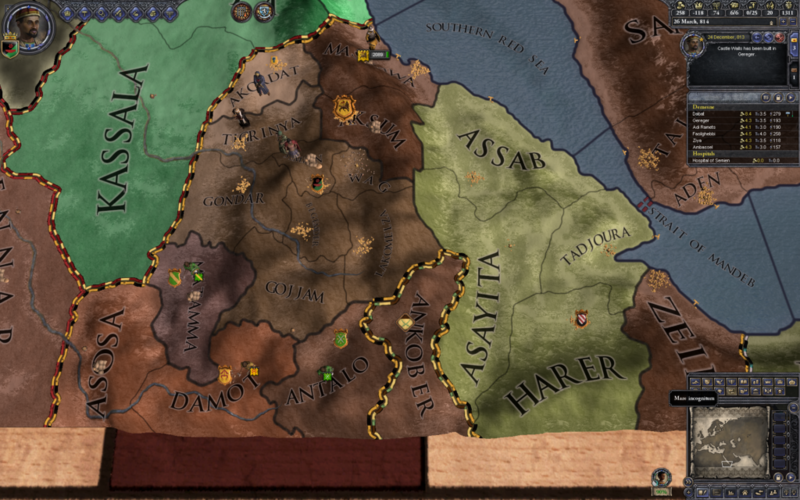 Finally, after not quite a century, Gondar returns to its rightful owners. Soon afterward, Semien’s victory is complete! Abyssinia is expelled from Africa. 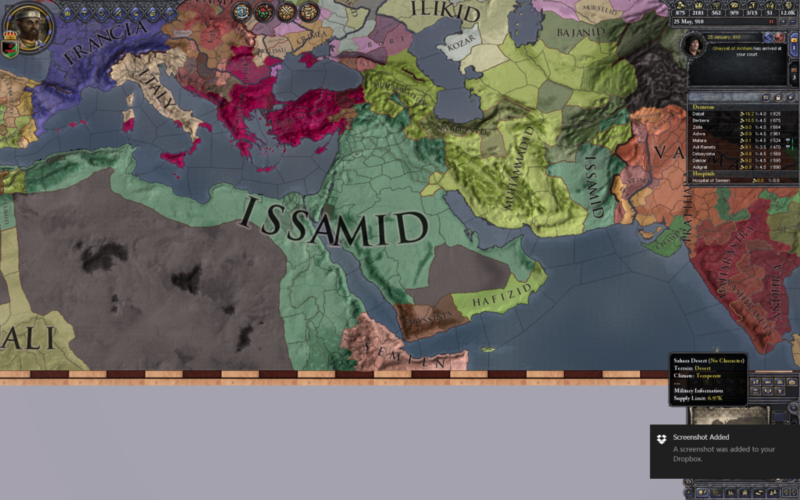 The bad news is that the Abbasids, while they have become the Issamids, are still far too gigantic to challenge. This is going to present a problem. The new king, Loua (who is only like 45 at this point) decides he’s had enough of this and would prefer to live forever. Apparently living forever is very expensive. I like to imagine these guys are out partying it up with the money. 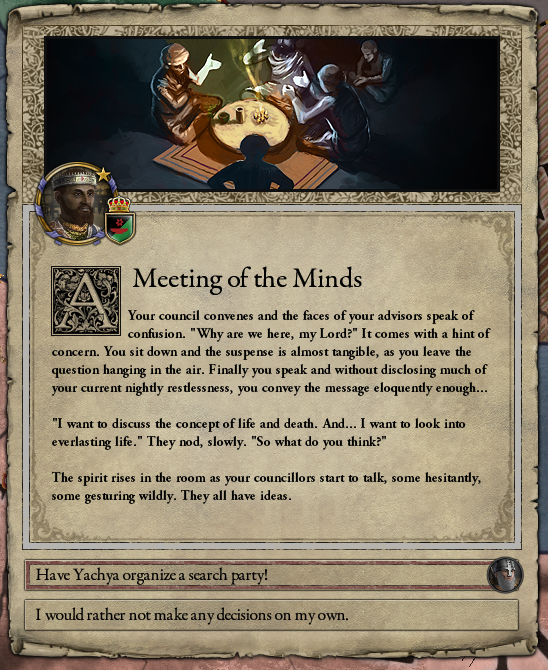 Sadly, Loua did not secure life eternal. 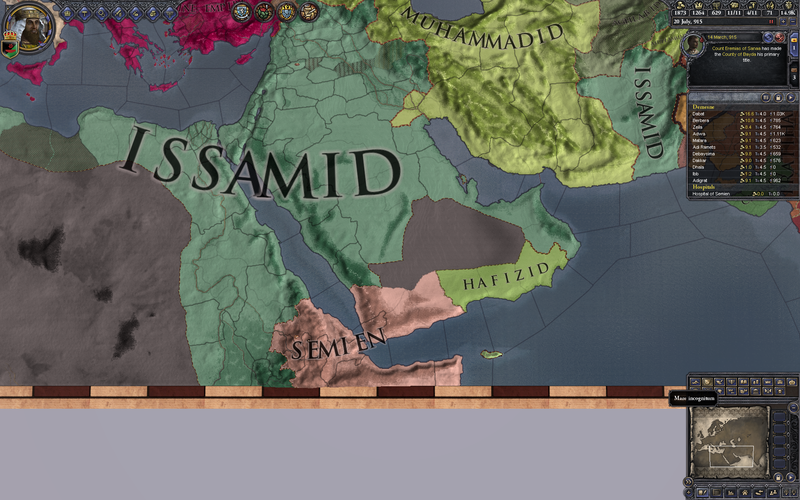 Current Year: 915 AD. Current Status: Apprehensive.